CareCredit is a healthcare credit card that helps you pay for treatments and procedures for you or your family that may not be covered by insurance. With special financing options* You can use your CareCredit card again and again for your dental needs, as well as at 200,000 other healthcare providers, including optometrists, veterinarians, ophthalmologists and hearing specialists. Learn more by visiting www.carecredit.com or contacting our office (626) 444-2002. Ready to apply? 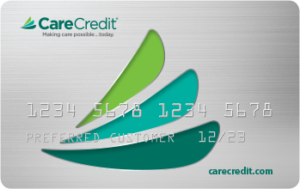 Apply online for your CareCredit healthcare credit card today.